In today's August 1, 2010 newsletter . . . 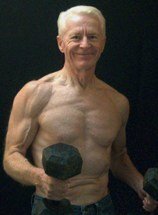 I was having protein drinks way back in the 1950s when I first started picking up barbells. The drinks were certainly different than today’s smoothies, but the idea was the same: Drink something that is good for you and a muscle builder. I came up with my own brews, usually drinks with a powdered milk base. Not all of the mixtures I tried had a pleasant taste. The ones I picked up from the muscle magazines weren't much better and sometimes a lot worse. One of the strangest — and god-awful tasting concoctions — came from Fred Grace, who wrote for Peary Rader’s Iron Man Man magazine. He was one of those wonderful old characters with a take no prisoners attitude about training — and dietary practices. Grace’s favorite potion included brewers yeast, desiccated liver, dolomite, a wheat grass of some sort, powdered milk, and probably a few other things that I’ve forgotten. The taste? It would gag a maggot. Still, muscle heads and other denizens of the jock world would put up with almost anything if they thought it would make them bigger or stronger or better. Thank God steroids weren’t around yet. I think I was smarter than that. Yet who really knows? When the "enhancements" did appear, there were some pretty okay people who took a bite of the apple. Most later regretted it, and have said so. But back to protein drinks, the shakes and smoothies, as they are called today. 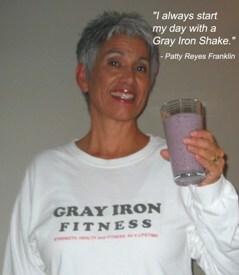 For a long time, I’ve been starting the day with the same breakfast: The Gray Iron Fitness Super Shake. Do I tire of it? Absolutely not. To begin with, it is super delicious, chock full of vitamins, anti-oxidants, Omega-3, protein . . . I could go on and on. Let’s just say that it’s good for you. Really good for you. It is also delicious and quick and easy to prepare. I read the morning paper, enjoy my shake, and pop down a Vital Choice salmon oil capsule. About two hours later, I have a slice of whole grain toast with peanut butter, a piece of fruit, and glass of nonfat milk. Some people reverse the order, having the toast (or oatmeal), fruit and milk first, and then follow with the smoothie a couple of hours later. Either way, you are really prepped to begin your day. Try it and I bet you’ll wonder why anyone would sabotage himself by starting the day with sugary pastries or sweetened junk cereals. Here is how to make the basic Gray Iron Fitness Super Shake. In a blender, put . . .
1-1/2 tablespoons of freshly ground flax seeds (don’t put them in whole; use a coffee grinder). 1 heaping tablespoon of plain nonfat yogurt (the kind with live friendly bacteria. No sweeteners). 1 scoop (20 grams) of whey protein powder. No flavoring or sweeteners. 1 cup of fresh or frozen mixed berries. No sweeteners. I like to add some fresh cranberries now to the mixed combination of blackberries, blueberries and raspberries. The cranberries add a pleasant tartness that I like. If you try them, just be careful not to add too many, since they could make the drink too tart. Add just a few at first and gradually include more to discover just the right taste and formula you prefer. Another thing I’ve found is that I can toss in some fresh spinach leaves. Experiment. Start with just a few leaves; add a little more each time and find out how much you can include without changing the berry flavor. Why do it at all? Most of us should be adding more vegetables to our diet. This is a way to get a daily head start in doing it. The Gray Iron Fitness Super Shake: Try it. You’re gonna love it! Yes, barbells are the berries. Kettlebells really rock. And resistance bands are the bomb. But body-weight exercises can be used successfully, too, for strength and fitness training. The musculature of gymnasts is an example of what can be achieved using a trainee’s own weight for resistance training. Before the steroid era of professional bodybuilding, it was common for weight lifters and bodybuilders to incorporate hand balancing and gymnastics of various sorts in their weight training . . . read more here.